Ukrainian President Viktor Yanukovich said late on Wednesday that he had agreed a "truce" with opposition leaders after 26 people were killed in street clashes, ahead of meetings with EU foreign ministers who are threatening to impose sanctions for the violence. By Richard Balmforth and Natalia Zinets. A statement on the Presidential website announced an agreement for “the start to negotiations with the aim of ending bloodshed, and stabilising the situation in the state in the interests of social peace”. A tense stand-off between protesters and riot police continued on Thursday morning in Kiev, where the foreign ministers of France, Germany and Poland will later meet Yanukovich before returning to Brussels for a meeting of all 28 European Union foreign ministers to decide on targeted sanctions for Tuesday night’s violence. Yanukovich, backed by Russia, had denounced the bloodshed in central Kiev, where protesters have been dug in for almost three months since he spurned a trade deal with the European Union in favour of closer Russian ties, as an attempted coup. His security service said it had launched a nationwide “anti-terrorist operation” after arms and ammunition dumps were looted. The violence, the worst since Ukraine’s independence from the Soviet Union 22 years ago, provoked a chorus of condemnation from Europe and the United States. EU ambassadors discussed a series of possible steps including asset freezes and travel bans in talks on Wednesday. “The European Union will respond to the deterioration on the ground, including via targeted measures,” European Council President Herman Van Rompuy said in a statement, while holding out the possibility of trade and political agreement with Ukraine if it meets goals agreed with the EU. In consultation with the EU, Washington is also considering the use of sanctions against those responsible for the violence, a senior U.S. official said. While EU officials said they were considering targeted sanctions for the “unjustified use of excessive force by the Ukrainian authorities”, they said Yanukovich himself would be excluded from such measures, in order to keep channels of dialogue open. 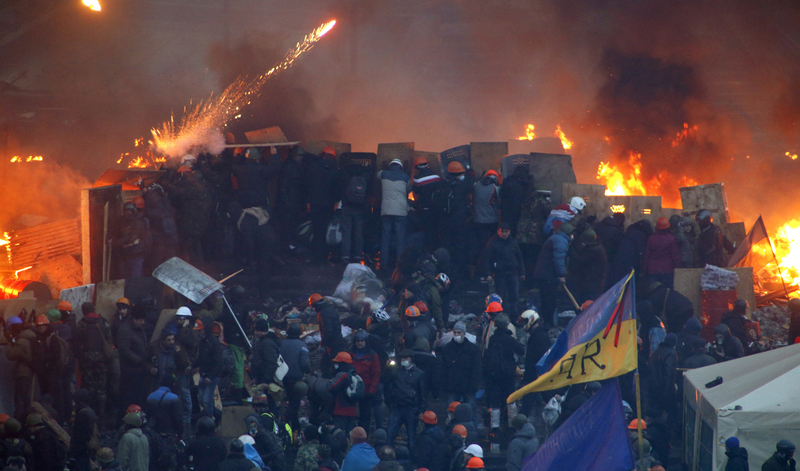 As well as asset freezes and visa bans, ministers will discuss measures to stop riot gear and other equipment being exported to Ukraine and could consider arms restrictions. The United States, going head to head with Russia in a dispute heavy with echoes of the Cold War, had urged Yanukovich to pull back riot police, call a truce and talk to the opposition. Pentagon spokesman Colonel Steve Warren warned the Ukrainian armed forces to stay out of the conflict, as “participation would have consequences in our defense relationship”. The sprawling nation of 46 million, with an ailing economy and endemic corruption, is the object of a tug-of-war at a global level between Moscow and the West. But the struggle was played out at close quarters, hand to hand, in fighting through Tuesday night on Kiev’s Independence Square, or Maidan. Russian Foreign Minister Sergei Lavrov blamed the West for encouraging opposition radicals “to act outside of the law”. Fires are still blazing along the barricaded frontline between the protesters and riot police, but there was no immediate sign of a repetition of Tuesday’s violence. Moscow had announced on Monday it would resume stalled aid to Kiev, pledging $2 billion just hours before the crackdown began. The money has not yet arrived, and a Ukrainian government source said it had been delayed till Friday “for technical reasons”. Ukraine’s hryvnia currency, flirting with its lowest levels since the global crash five years ago, weakened to more than 9 to the dollar for the second time this month. Yanukovich said he had refrained from using force during three months of unrest but was being pressed by “advisers” to take a harder line: “Without any mandate from the people, illegally and in breach of the constitution of Ukraine, these politicians – if I may use that term – have resorted to pogroms, arson and murder to try to seize power,” he said. He declared Thursday a day of mourning for the dead. The state security service said it had opened an investigation into illegal attempts by “individual politicians” to seize power. One opposition leader, former world champion boxer Vitaly Klitschko, had walked out of talks with Yanukovich over Tuesday night, saying he could not negotiate while blood was being spilt. Apparently with an eye to possible sanctions that might have consequence for big business interests, three of Ukraine’s richest entrepreneurs have stepped up pressure on Yanukovich to hold back from use of force and make every effort to solve the crisis through negotiation with the opposition.